I define Impact Investing in the terminology section of my website as investing that "drives social and environmental progress through investments, while screening for risk and creating competitive returns." There is no universal definition of this term, which can be challenging. But most people have a general understanding of the term and it's a good jumping off point for conversation, which I'll talk about in the second section of this post. But first, let's look at the evolution of and current use of this term. History: Ethical and values based investing related terms have been used to describe investing or divesting based on a set of morals and/ or values since the 1970s. In 2007 The Rockefeller Foundation coined the term impact investing for "investments made with the intention of generating both financial return and social and/or environmental impact." Note that this definition is broad on the subject of returns. The investments seek financial return, but not necessarily competitive with the broader market. This is typical of early use of the term when it was often used to make a distinction between philanthropy and investing, and usually referenced private investments. Some investments yielded healthy returns, while others had expectations of below market rates of return. While accepting below market rate returns on private investments or loans can still be a part of an impact investing strategy, use of the term has evolved since 2007 and many professionals in the field now use the term to refer to investments with goals of competitive returns. And while the term was coined primarily in reference to private investments, in the past few years, I've heard the term increasingly used in reference to both public and private markets. As an interesting side note, the Rockfeller Foundation now uses a new term for their work in this space (which includes both grants and investments): Innovative Finance. So add that to your long list of terms! Impact investing as a synonym for community investing: Some people use the term impact investing to refer specifically to the act of lending capital to targeted underserved communities, often through the work of CDFIs (Community Development Financial Institutions). This type of investing is increasingly referred to now as "deep impact" or sometimes "place-based" investing, if the lending is targeted geographically. My anecdotal experience indicates that use of this term is still primarily in reference to private investments, but increasingly can be in reference to public ones too. In terms of returns, the the term impact investing still often references strategies with a wide range of returns. As the impact investing term evolves, best practice is to discuss the nuances of investment details and expectations to make sure you are on the same page as the person or company with whom you are speaking. Why do you use the term impact investing? 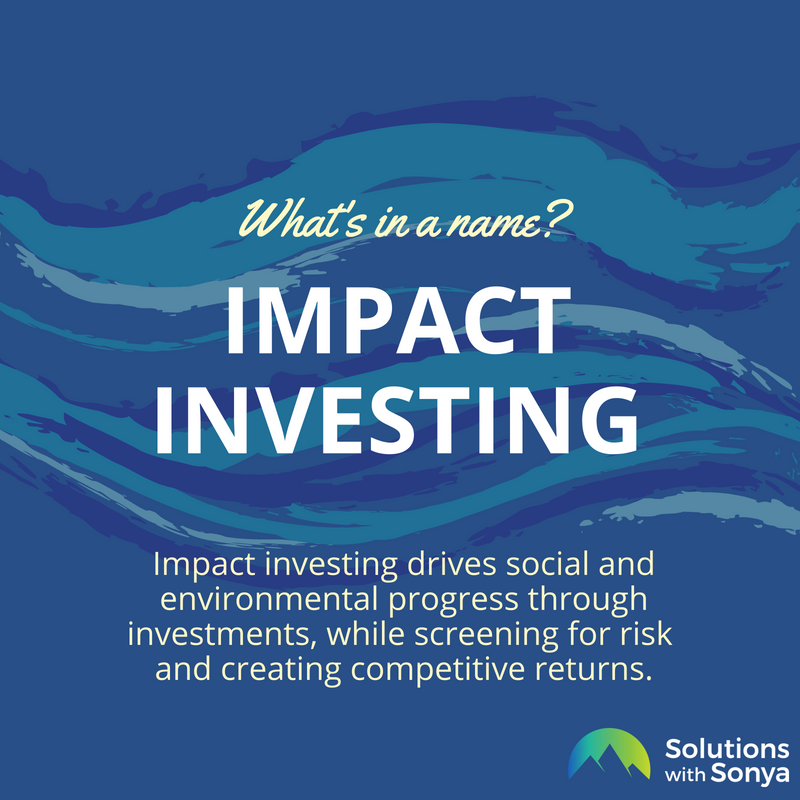 I use the term impact investing as a broad umbrella term for all type of values based, community, and ESG focused investing, both public and private. I use this term, partly as an example to my clients. I tell my clients who are creating impact or sustainable investing offerings to find the wording they are most comfortable with, wording that is reflective of their firm and their methodology, but most importantly that they use words, not letters or acronyms. Financial services has a tendency to rely heavily on abbreviations and terms that are confusing to most investors. Using industry jargon when speaking with clients may alienate them and make your financial advice hard to understand. This problem is not unique to the impact investing community; I'd argue most clients don't fully understand us when we talk about "smart beta" or "Monte Carlo simulations" or even "indexing." I encourage the financial services firms I work with to pick words that are both explanatory and engaging; those words might be "sustainable," "environmental," "values based," "purpose driven," or any number of other terms. For me and my business, that term is impact investing. I'm curious to hear your take on terminology, and what you use in your business. Send me a note at sonya@solutionswithsonya.com!